Why should we have our soil tested? What will a soil test tell us. Based on UGA Extension Office test. When and how often should I have my soil tested? Can sample at any time, but want to allow enough time to get results, treat the soil and allow the recommended additives to work before the growing season begins Fall or early winter would be ideal, but still time to do it now. 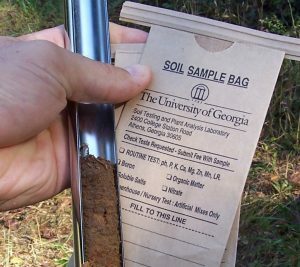 To avoid skewed results, don’t take samples from right next to you compost pile, or up against your foundation or any slabs of concrete. Depth is important-4” deep for lawns, 6” deep for planting beds as this is depth of most feeder roots.